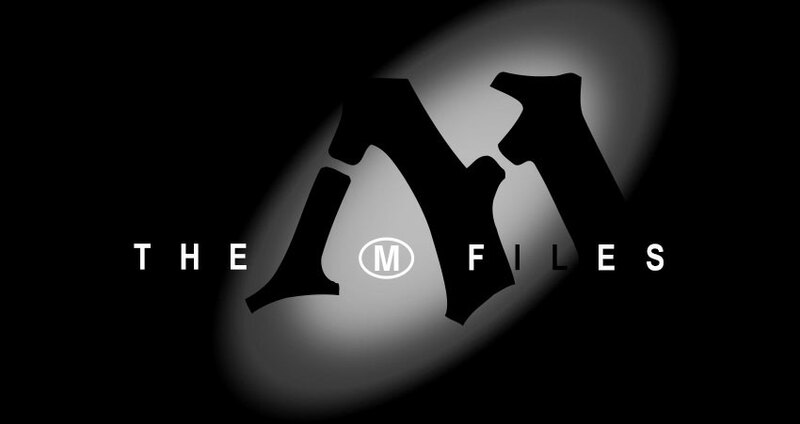 You're here for the stunning conclusion to the Guilds of Ravnica M-Files. Don't forget to check out the first half of the series where we talked about monocolor cards here. Today, in true Ravnica fashion, we bring you all that sweet multicolor action. Once again, Drake (formerly Multiverse) is one of the tools we use when developing cards. Everyone in Magic R&D is encouraged to make frequent comments on individual cards. Speaking of comments, click below to check out who you'll be hearing from today. KEN: Can't seem get rid of this one . . .
Ahh, we begin with the familiar. Skyknight Legionnaire reminds us of where we've been and conveys a simple message: "Ravnica is back . . . again!" It's good to be back. ABRO: New Design, more expensive Agony Warp. KEN: Was -4/-0 and -0/-4 instant, but too crazy as a combat trick. Now 2UB sorcery, tap a guy and -3/-3 a guy. ABRO: Was -3/-3 on the second choice, now larger toughness kill per off-site. EEF: Does this need to be a modal spell? ELI: When it wasn't modal, people thought both effects hit the same creature. Modal loudly says otherwise. Great question, Ethan. A modal spell is one that gives the player a choice between multiple effects. No Ethan, this does not need to be a modal spell. However, as Eli mentions, it wants to be a modal spell to clarify that the two creatures chosen do not have to be the same. MDT: This looks strong for common. NKM: Currently leaving planeswalker off this card. ABRO: Problems with fizzling if target is bounced. AF: Is there a way to template this so that you target when you discard? Would we want that? ELI: Reflexive triggers can do that if it's what we want. Opponent must respond before they know what you're targeting if so. NKM: Eli has words that allow you to target when you discard. KEN: Now you can keep the two cards if you like. Excellent work on the name here, Creative team. Digging a little deeper into Drake, the original playtest name was "Blasting Thought," and I am glad we ended up where we did as this is a much hotter name. During initial testing, the draw effect kept getting countered because players would sacrifice or otherwise remove their target once it was chosen. Eli came up with a solution that created a reflexive trigger after the spell resolved if you chose to discard a nonland card. Be careful; if you do want to counter a Hypothesizzle, you must act before your opponent confirms whether they are doing the damage. GSV: Now a convoke card. TABAK: Power is the first number, Gavin. JDR: Keeping them straight is tough. Magic R&D with the jokes again. I will stress that it is important to articulate your intent clearly and concisely with your coworkers. Failure to do so will generally result in light mockery. KEN: Was draw two they lose 2, now surveil 2 draw two lose 2 life like Read the Bones. AF: Curious how we feel about this dealing damage to you instead of life loss. EVL: I don't care whether this causes damage or life loss. NKM: Now this deals damage to you. No life loss in Guilds of Ravnica. First, wow that art though. Second, Magic R&D is all about experimentation, and lately, you may have noticed a distinct lack of life loss. What do you think about this change in philosophy, for the time being at least? Finally, with the key number on the card being two, we thought it would feel more like a Notion Rain than a Thought Drizzle. AF: Can we consider Eternal Witness text? Or is something obviously too dangerous with that? KEN: 2/3 -> 3/3 but now is Eternal Witness ability. Future Future League can try breaking it. KEN: Now returns a permanent card because it was looping with things like double Raise Dead spells. ABRO: We can probably go to 4 toughness on this with low cost. NKM: Digital prefers mandatory return. Except for previous similar cards, no strong preference otherwise. It is unclear whether Golgari Findbroker looping consistently with Raise Dead spell effects was too powerful for Standard. However, one of the many things we try to avoid is play patterns that are too repetitive. Diversity of games and experiences is what keeps Magic fresh, new, and exciting after all these years. Discovering negative play patterns like these is what having Play Design and the FFL is all about! Also, it should be noted that in very rare instances, even though you must, you may not want to return something from your graveyard with the Findbroker's ability. But in every instance, you will certainly not want to click multiple times to confirm that you do. NKM: Updated to "any target"
Split cards are back! Play Design identified that the Intervention half of the card was desirable for Constructed play early in the testing process. One of the challenges in developing split cards is creating two halves that you want to cast. 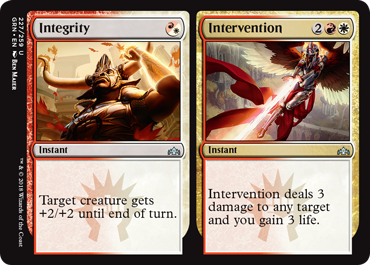 If you always cast Intervention instead of Integrity, what is the point of even making this a split card? Erik buffed the combat trick so that you would want to cast it roughly as much as you want to cast the damage effect. TABAK: Erik, currently, if you have no creature cards in your graveyard, the creature gets a +1/+1 counter and then is sacrificed. Is that okay? Also, confirm that you don't have a choice in the matter. If there's a creature card to exile, you must. EVL: Getting a counter and then being sacrificed is weird; let's not do that for many reasons. EVL: I think "must" is correct. ELI: Also, if you can't put a counter on it (e.g., Solemnity from Hour of Devastation) you have to sacrifice it even if you exile a card. DOUGB: Fun quest! I like this. Matt and Eli caught some nuanced rules interactions here. Set leads often use words that match their intent, but sometimes those exact words don't quite match the function they desire. A small desk-side conversation and a few buffs later, Charnel Troll had achieved its final form. KEN: I like this as is! Also, quite unbeatable in Limited. NKM: Updated to "any target." ELI: Goes infinite with Curiosity; yup, this is Niv-Mizzet. ID: Though not reflected in Drake yet, FFL should be playing last ability triggering off either player's instants and sorceries. NKM: Updated second triggered ability. Now triggers off everyone's instants and sorceries. Does Niv-Mizzet always have to go infinite with Curiosity? Apparently so! This Parun started in a decent spot and then was molded bit by bit during FFL. People kept playing sideboarded games with it and commented on how it was effective but could be a little stronger. 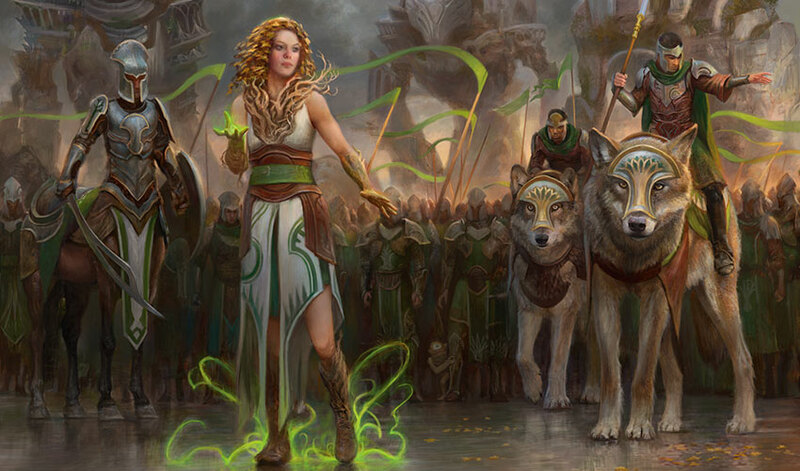 Niv eventually gained the ability to draw cards from both player's instants and sorceries and even increased in size. EVL: Now 1GW 3/2, and you gain 2 life. DEL: Review: Look for other options for a hoser ability? Current text triggers every single turn! NKM: New text, triggers once but works for everyone. ABRO: Was ETB gain 2, dies draw a card. Now a new design for FFL. JDR: This card is sweet. ID: I suggest 2/1 with either two +1/+1 counters or destroy an enchantment. EVL: Now can also destroy artifacts. Life gain? Check. Midrange combat creature? Check. Able to interact with problematic permanents? Check. This little Dryad does it all! FFL desired a card that would be strong against the red decks of the previous year while at the same time hold its own versus the various Search for Azcanta strategies. The art and flavor of the card is also wonderful, as Selesnya happens to be in autumn this time of year. Does the "anti-Hostage Taker text" look familiar? See if you can find that ability in the set somewhere else. GSV: New design from Gavin. Ian thinks we can start it at BG instant, so putting it there for now. SPS: This looks too strong to me, but it might be worth doing. ID: Plenty of knobs here: BG sorcery, 1BG instant, etc. This looks right to try first. KEN: "permanent you don't control"? KEN: Path to Exile target nonland permanent. Get your basic lands ready! ID: I like having strong removal spells that help define multicolor pairs. We just need to make sure this isn't so much stronger than what other combinations get that it restricts deck building. I think this is a good rate to start testing. DEL: Review: Consider whether "an opponent controls" is necessary? EVL: No longer hits your stuff. The strongest removal spell shouldn't also self-ramp. EVL: No longer removes enchantments. VEENA: Do we want to let this hit nonbasics to fight some of the Ixalan double-face cards? ID: Erik wonders whether this should hit lands, but the land enters untapped. Then able to hit Azcanta. EVL: Any permanent, but the land is not tapped. Wow. Golgari back at it again destroying anything and everything in their path. As you can see, there was some internal debate on whether Assassin's Trophy would be too strong for Standard. At the end of the day, the goal is to make exciting cards. What was your reaction the first time you read this card? Did you want to turn your opponent's prized possession into a silly basic land? With the existence of the Play Design team, we can come much closer to the edge of power levels acceptable for given environments. DGH: Big dreams to be had here. ID: Seems fairly easy to build such that you win the turn you untap with this. ID: Doesn't look Constructed unless there's a combo deck with it. BRYAN: Looks sweet to try at this rate. Would love if this is fringe Constructed. KEN: Up to mythic rare. NKM: Not quite storm (only counts your spells), but should work. ID: Note that the total number of copies is one more than you'd get if the spell had storm printed on it. NKM: This should probably allow new targets for copies too? Storm is back in Standard . . . kind of. Izzet loves high-costed, impactful spell-based enchantments, and Thousand-Year Storm certainly delivers on that front. Granted, it will generally be difficult to untap with this and still have enough fuel left in the tank to unleash a flurry of spells. Bryan makes a great point about "fringe Constructed," a subjective term that implies some success but not necessarily the strongest strategy. If Thousand-Year Storm was the centerpiece of the strongest deck in the format, how would you feel playing against it constantly, sitting there while your opponent had all the fun? Cards in this category are charming in moderation but can easily be oppressive if too prevalent. ELI: Does this want to also stop them from casting spells from their graveyards to prevent priority fights with flashback, aftermath, jump-start, etc.? ELI: Updated words to match my suggestion per Erik's email request. ID: Great against those pesky Black Lotus decks. DEL: Okay that opponent can activate abilities of cards in their graveyard? JDR: If we do allow it, I certainly expect some players to get very confused trying to play this against a deck with Bone Dragon in Standard. NKM: Now stops activated abilities too. Still fits but can't add more words. DEL: Review. Card needs help. One promising thought is to just stop opponents from doing stuff, full stop? NKM: Rearranged first sentence, now leads with the cool part. NKM: Looking at some new words with similar function. NKM: New words, used to leave the cards in the graveyard but deny opponents use of them. Now exiles and returns. Fun fact: when you try and do things with your opponent's graveyard, they may also want to do things with their graveyard to reduce the effectiveness of your actions. Mnemonic Betrayal's initial concept was simple, a card that resembled the iconic Yawgmoth's Will but used the opponent's resources instead of your own. Implementing this had numerous hurdles to overcome. If the opponent had spells or abilities they could use from their graveyard, things could get convoluted with who has priority when both players wanted to utilize the same card. This was confusing and frustrating; players would end up not even casting the spells they wanted to cast. Eventually, the solution was found to just exile everything and allow you to cast the opponent's cards from exile, putting them back when the turn ended. Elegant. KEN: Saprolings. Lots of Saprolings. KEN: Mythic rare? This might look like it's in a cycle with Sphinx's Revelation and Rakdos's Return (maybe). KEN: Saproling -> 1/1 lifelink. KEN: Rare -> Mythic rare. DGH: This reads more like a rare than a mythic rare to me. ID: If this isn't hitting in Constructed, instant would be an easy way to get it there. ID: Do we want to try instant? EVL: Removing the extra G from the casting cost. Wants to be mythic rare. DGH: Okay, this feels mythic rare now. The initial design here was a costly convoke spell that made loads of tokens. After the tokens picked up lifelink, the card was upgraded to mythic rare. Some felt that wasn't quite special enough. After more testing, Ian suggested we try instant over sorcery. The cost was still a bit too restrictive to make our FFL decks. Once the second G was removed from the casting cost, March of the Multitudes was finally able to shine during Standard testing. Be sure to check out the amazing art by Zack Stella, who added a little something special. Can you find it? KEN: Maybe this is a 3RW Angel? It's really smashy in Limited. DGH: A bit of a stretch as a mythic rare, but legendary Angel helps it get there. Looks like a fine Constructed card. TABAK: New last abilities from Boros mini team. MDT: Sad that Deafening Clarion kills this; I want to play them in the same deck! DSJ: Found this card underwhelming. Inclined to play Leonin Warleader or no four-drops instead in most Boros decks. DEL: +1 for mandatory plus "you control"
ABRO: I like these suggestions. ELI: Once you remove "you may," you could leave it without "you control": you'll normally be able to target Aurelia if nothing else. JDR: I like mandatory, but with "you control" for fewest clicks in digital (auto-resolve if it's your only creature). NKM: Play Design keeps optional ability because of interaction with Justice Strike. Gains "you control." NKM: Now "up to one" per Erik and the mythic wall comments. NKM: New text from FFL. Now adds trample to red creatures, and vigilance to white creatures. ABRO: Justice Strike point now moot. NKM: Change agreed on. Now a 2/5. We often form "mini teams" when certain design objectives need to be solved. One was formed for each of the guilds to help brainstorm what kind of abilities all the key figures could have. As Aurelia is the leader of the guild with the mentor mechanic, the mini team found it would be cool if she could have a kind of "super mentor." There was some discussion on what kinds of things Aurelia should be able to target. This is a case where a more digital-friendly implementation was considered but, for power-level reasons, was ultimately decided against. Aurelia's friends might actually be more susceptible to certain removal spells if she always had to target something. Ironically, Justice Strike was the key removal spell that was causing problems for Aurelia and her friends! This time, justice prevailed. And that's all I have time for today! Thanks for joining me on this glance back through the card file for Guilds of Ravnica.